Keep inquisitive squirrels busy in your backyard with the Songbird Essentials Recycled Plastic Squirrel Jar Feeder. Including a squirrel-specific feeder in your backyard sanctuary can sometimes keep these animals well-fed and occupied, preventing them from raiding your bird feeders. This innovative item uses a squirrel's natural, curious nature to keep it both occupied and fed. The green, recycled plastic body attaches to a tree or post easily, for squirrels to reach it, and supports a generous, clear glass jar. This jar removes from the framework for filling, and can easily hold up to 2 quarts of peanuts in the shell or corn. The two open sides enable a squirrel to enter the unit, and the 4" diameter opening on the jar allows it to reach the feed easily. The extended, base platform supports this vessel, and the lengthy back panel makes it easy to attach this item to a post or wall. 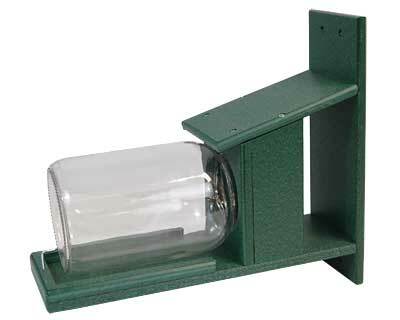 The green tone of the feeder meshes with your backyard foliage, and its recycled plastic construction adds durability. Enjoy squirrel antics in your backyard with this Recycled Plastic Squirrel Jar Feeder. Made in the USA. Lifetime guarantee.